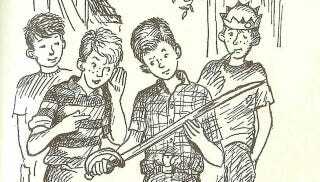 I grew up with Encyclopedia Brown. He was my kind of hero, a kid who beat the bad guys not with brawn or physical skill, but with his mind. When I was around ten years old (I'm approximating), I used to devour every story of Leroy "Encyclopedia" Brown, his partner Sally, his nemesis Bugs Meany and the many kids and adults that he helped along the way. I loved the setup, the way it turned so many things around—remember how Sally was the muscle? She could take Bugs down if she wanted to! I was sad to see today that Donald J. Sobol, the author of the long-running series, had died at age 87. So I thought I'd take a minute to reflect on the series, which I have a feeling worked its way into the childhood of many a Kotaku reader, as well. Just looking at the covers of his books—the gasoline can with the "25 cents" sign, the way that sometimes multiple stories in one book would tie together, the town of Idaville, the familiar episodic structure of each book… and of course, the way that each mystery would challenge you to solve it before Encyclopedia and Sally, given the clues on hand. I don't think I ever solved too many of the mysteries (though I do recall besting one involving illegal fireworks and birds on telephone wires), but I always appreciated that the books got me involved. They weren't a choose your own adventure, but they also weren't quite a "normal" book. They were something more, and I loved that. I never watched the HBO series, though I have to say that the characters would make for a great TV or film adaptation. Or hey, even a good video game! Some sort of episodic point-and-click adventure thing? I'd play the heck out of it. Did anyone else here read Encyclopedia Brown? Did you guys like the books as much as I did? What were some memorable cases that stick with you? Chat about that here, and feel free to hit up the Talk Amongst Yourselves forum. Have good chatting, see you tomorrow.